Join us on this Virtuoso Voyager Club adventure as we travel to Mexico, Guatemala, Belize and Honduras, and experience each country’s undeniable allure. Wander amid Mayan ruins and have lunch on a Cozumel beach. Go fly-fishing in Costa Maya, and soar over stunning Tikal National Park in a helicopter. You can even enjoy the relaxation and revelry of Key West, the “Conch Republic”. This sweeping Central American adventure is one you’re sure to enjoy. Exclusive Offer: Enjoy a 10% Single Supplement on this Voyage. Continuing its tradition of offering outstanding resorts and hotels, several properties in Mexico have recently been awarded by major international publications for their excellence. Mexico now proudly has 13 AAA Five Diamond hotels and a total of 37 properties have made it on to the Conde Nast Traveler’s Gold List. Experience the breathtaking views and world-class service of Grand Velas Riviera Maya! With luxury infused into every aspect and amenity, this AAA Five Diamond all-suite resort features expansive accommodations across three distinct sections and offers an international culinary tour at eight gourmet restaurants. Enhanced by an award-winning spa and over 1,000 feet of pristine white sand beach, this memorable escape will truly be the Ultimate All-Inclusive Getaway! Exclusive Upgrade + $50 Daily Spa Credit + Kids Stay & Eat Free! Valid for new bookings through 4/30/12 and travel from 5/1/12 through 12/19/12. *Listed rate In the Zen Grand Suite are based on occupancy of 2 Adults and 2 Children (ages 12 and under). **Listed rates in the Ambassador Suite and Ambassador Pool Suite, are valid on children ages 4-16. ***Tour to Rio Secreto is valid on 3-night minimum stays and Tour to Xplore is valid on 4-night minimum stays when staying in the Zen Grand and Zen Grand Pool only. ID Exclusive offer is valid for new bookings through 10/31/12 for travel 5/1/12 through 12/29/12. Upgrade from Ambassador Pool Suite to Grand Class is valid on children ages 12-16. Certain restrictions apply. Blackout dates may apply. Not responsible for errors or omissions. Spa credit is non-refundable, non-accumulative or non-transferable and is not valid for use in hydrotherapy area, spa boutique and beauty salon. Call us today to take advantage of this special offer! Le Blanc Spa Resort is an all-inclusive property situated on 250 yards of white-sand beach on the eastern shore of Cancún. The modern guestrooms each feature a balcony or terrace with an ocean or lagoon view and double Jacuzzi. This resort offers three pools including two infinity pools, haute cuisine, and a spa. Adult guests seeking tranquil, romantic relaxation enjoy this mid-sized resort. Facing a white-sand beach, this intimate boutique resort is located 3 miles from downtown Isla Mujeres and less than 6 miles from downtown Cancun. Guestrooms feature balconies with hammocks and bedrooms with 2-person jetted tubs, LCD TVs, replenished mini-bars, bathrobes and slippers. Amenities include a freeform pool and a beach club. Isla Mujeres Palace is a boutique, all-inclusive resort located on Isla Mujeres, a small island off the coast of the Yucatan Peninsula. The resort attracts couples and families seeking a quiet Mexico vacation that seems far away from the crowds in Cancun. This intimate all-inclusive resort situated in the Riviera Maya is set in the exclusive Playacar hotel zone, in the heart of Playa del Carmen. The resort offers 208 well-appointed rooms with ocean views, private double spa tubs and other fantastic amenities. Enjoy an outdoor pool with swim-up bar, fitness center, kids’ club, international cuisine, three bars, unlimited select tours, and daily transportation to Cancún. Comfortable accommodations featuring a double spa tub and stunning views make this a great Mexican getaway for travelers looking to relax and unwind but still have proximity to shopping and entertainment. Nestled between the mountains and the Pacific Ocean, this all-inclusive resort is situated on the beautiful beaches of Bahía de Banderas. 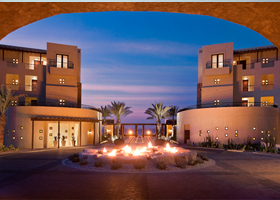 The resort offers 348 accommodations with a double spa tub, turndown service; most with balconies and ocean views. Vallarta Palace offers swimming pools, scuba diving, fitness center and excellent restaurants and bars. Ideal for families as well as couples seeking tranquility, the resort includes activities for adults and an air-conditioned Kids’ Club with supervised activities, video games, and movies. Terms & conditions: $1500 in Vacation Dollars may be used towards: Wedding Collections, Tours, Golf, Spa/Beauty Salon, Upgraded wine selection, Romantic Dinner, Room Upgrades, Photography packages, Casino, and Dolphins. Offers are valid on new bookings only and are not combinable with other offers. Sample prices are land only, per person, based on double occupancy. Actual prices may vary based on travel dates and availability. Book by 4/30/12 for travel through 12/23/12. Offers are subject to availability at time of booking and may be changed or discontinued without notice. Blackout dates, minimum night stays, seasonal surcharges, taxes, resort fees and other restrictions may apply. Visit Grand Velas Resorts - $829 for a 3 night stay! Escape to the tropical bliss of Mexico, where turquoise waters, spectacular beaches, brilliant sunsets, blue skies and the rhythms of the night enchant your spirit. From the vibrant energy of Puerto Vallarta to the tranquil beauty of the Yucatan, Mexico is a magical vacation destination where romance and adventure ease your soul. CALL IANNAZZI ENTERPRISES – YOUR MEXICO SPECIALISTS – TODAY! Save up to 25% & Enjoy Free Daily Green Fees at All-Inclusive Iberostar Hotels & Resorts booked by May 15, 2011. 3 nights starting at just $299!It’s a vacationer’s dream, transformed into a beautiful reality. Iberostar’s all-inclusive resorts offer deluxe accommodations in the most breathtaking settings.Lined by pristine beaches, turquoise water and swaying palms, Iberostar resorts offer endless sunny days filled with all the advantages of a spectacular all-inclusive experience. From friendly service and a wide variety of dining and entertainment options, to water sports or a relaxing poolside drink, it’s all yours for the taking. This exceptional offer is available only through Iannazzi Enterprises. Contact us today at 585-624-1285. Take advantage of our resort expertise! and ask about our inexpensive trip protection plans! Terms and Conditions: Prices do not include airfare. Special promotions valid on new bookings only. Prices are per person, based on double occupancy accommodations. Packages do not include meals unless otherwise indicated. Savings reflect land prices only and vary by resort and travel dates. Availability is limited. Rates are subject to holiday blackouts, peak period surcharges, and cancellation charges may be applicable of up to the full price paid depending on the package and when it is cancelled. Valid for travel 4/30-6/24/11. Kids stay FREE and tremendous Summer savings! Riviera Maya is the perfect place for families to spend their summer vacation. Azul Fives Hotel caters especially to those with kids. The Azulitos kids club is designed to entertain the young ones while the parents relax along the beach sipping cocktails brought out by beach butlers. This summer, not only can families enjoy this Gourmet Inclusive a la carte dining experience, they can enjoy this kid inclusive special! Families receive a FREE stay for children ranging from 3 years old to 12 years old whether staying in a 1, 2, or 3 bedroom suite in this beautiful new, condo-style hotel. Call us to book your stress-free beachside family getaway!! From the glorious beach resorts of the Caribbean and Pacific coasts to the beautiful old Spanish Colonial towns in the heart of the country, to the ancient Mayan ruins of the Yucatán, Mexico will enthrall you. With a history going back over 30 centuries including 300 years of Spanish Rule, Mexico features attractions found nowhere else in the world. In a foreign setting with familiar amenities and friendly people, Mexico is easy to reach from anywhere in the US. Wonderful mariachi music serenades you while you sample the amazing range of delicious regional foods found throughout the country. A profusion of cultural experiences awaits you in Mexico all through the year. With a very favorable exchange rate, Mexico offers a wealth of travel experiences right at your doorstep.